Search for video and games by keyword or directory subject. Create online courses, allowing for class management, and OpenEd provides resource recommendations according to topics. 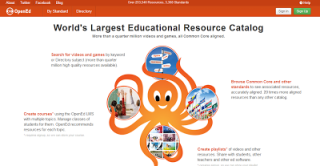 Browse Common Core resources and resources for other standards. Create playlists of videos and other resources for easier access later. Teachers can register for free accounts. OpenEd is free and open source and offers users a free applicating programming interface (API) so other websites can utilize OpenEd's resources. Check out OpenEd at their web site here: http://www.opened.io/.